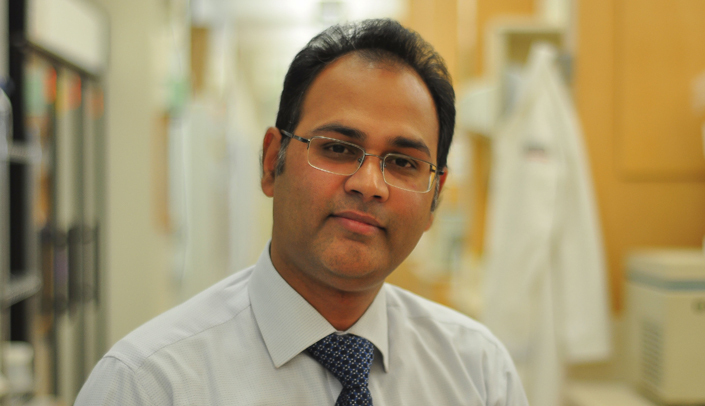 Meet New Investigator Paras Kumar Mishra, Ph.D. This profile is part of a series to highlight the 25 researchers and one community member who will be honored at a Feb. 2 ceremony. The recipients include the 2014 Scientist Laureate, nine New Investigators, 10 Distinguished Scientists, five Research Leadership awardees, and a Community Service to Research honoree. Name: Paras Kumar Mishra, Ph.D. The major interest of my research is to understand the underlying mechanisms that cause heart failure, especially in diabetics. Despite advancements in medical science, heart failure is still the number one cause of morbidity and mortality in the world and warrants novel therapeutic strategy. The goal of my research is to discover new, promising therapeutic candidate(s) that can mitigate and possibly revert pathological cardiac remodeling and ameliorate heart failure. The inhibition of specific regulatory molecule, such as microRNA-133a, can cause cardiac hypertrophy leading to heart failure. Similarly, overexpression of matrix metalloproteinase-9 (MMP9) is associated with heart failure in humans. We are investigating the therapeutic potential of overexpression of microRNA-133a and/or inhibition of MMP9 on amelioration of diabetic heart failure. This research has potential to be translational and advance our knowledge for finding future therapeutic candidate for heart failure. One of my MS teachers always used to say to me, and I still remember them as inspirational quotes: "Hard work never goes in vain," and "Any young man/woman with ambition, energy, a fair IQ, and good health can rise well up the ladder of accomplishment in the science if he/she has a mind to do so." I love to play outdoor games such as badminton.